Growing our own produce where possible is good for our health, wellbeing and environment. It helps to combat food air miles, provides us with food security and can save us money too. A kitchen garden, however small, can provide a household with fresh fruit and vegetables. This creates a wonderful feeling of achievement. A kitchen garden is a place where children can be educated about the natural world, growing fun crops such as beans, sunflowers and pumpkins. Having a vegetable garden also creates an opportunity to grow foods that are not readily available in the shops - there are as many older, non-commercially viable varieties as new cultivars to try. Some veg are hardy and can be sown straight into the ground while others are tender and need to be started off indoors. Sow the following under cover over the next month: aubergine, French beans, beetroot, broccoli, cabbage, cauliflower, celery, courgettes, cucumbers, peppers, chillies and tomatoes. From late March you can sow directly into the ground broad beans, calabrese broccoli, carrots, leeks, lettuce, onions, parsnips, peas, radishes and spinach. Quick-maturing vegetables, such as carrots, French beans, peas and salads can be sown successionally - this just means sowing fresh batches every fortnight so that you are getting a continuous, steady supply rather than one big glut. Broad beans: Try 'Aquadulce Claudia' for early cropping; 'The Sutton' is the most popular dwarf variety if space is limited. Beetroot: 'Boltardy' - as its name suggests - has good bolting resistance and is hardy. I've found germination very reliable with this cultivar. Broccoli: Purple sprouting is the most popular - sow now but you will need to wait till next spring before you can harvest. If you haven't the patience, try calabrese instead, which will be ready for harvest in autumn. 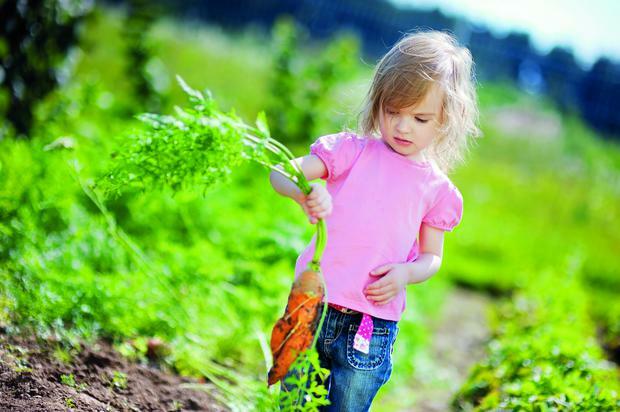 Carrots: One way to get your kids to eat carrots is to enlist their help in growing them. 'Early Nantes' has a good flavour and matures early. 'Flyaway' has good carrot fly resistance. Be careful when thinning your seedlings as that's when the dreaded carrot fly catches the scent of his favourite food - remove thinnings (or wash and put in salads). Cauliflower: 'All the Year Round' is the top favourite. Plant in fertile soil and keep well-fed for good crops. Fennel: Useful in cooking and beautiful to look at, as well as being easy to grow. Lettuce: If I had to choose one, it would be lollo rossa, with its curly red leaves: it looks and tastes good. Lettuce germinates easily from seed - remember to sow successively every fortnight to keep you in fresh salad throughout the summer. Parsnip: 'Tender and True' is an heirloom variety with good canker resistance - sow next month and you could still be harvesting them this time next year. Peas: 'Kelvedon Wonder' - immediately protect from birds after sowing with netting. Potatoes: I tend to stick to early varieties, which have no blight problems and are early cropping, such as 'Orla'. However, there have been huge advances in developing blight-resistant main varieties - 'Sarpo' has been bred to be highly resistant. Spinach: 'Bloomsdale' will produce tonnes of dark green crinkly leaves and is slow to bolt. Herbs: Sage, rosemary and thyme are extremely useful culinary herbs and when planted in a warm, sheltered position will come up every year. 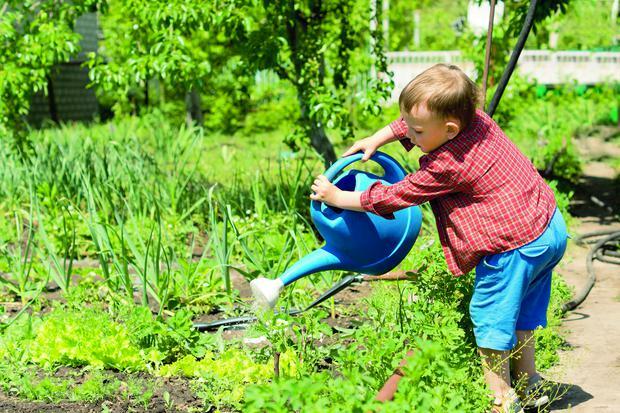 When your garden becomes established, it is really satisfying and it's also fun for the kids to collect your own seeds for the following years. Sweetcorn: Great fun to grow. It must be planted in rectangular blocks in order to ensure pollination. Just a few plant blocks can look like a mini corn meadow, and picking the cobs is always exciting. Test the ripeness of the sweetcorn by pulling back the sheath, once the tassels have turned chocolate brown, and squeezing it. If the liquid that comes out is creamy, the sweetcorn is ready to harvest - another job for the kids and a great way to get everyone eating good, fresh food. You usually plant one-year-old crowns, but don't cut the spears this year: you need to wait till next year. Beautiful ferny foliage in summer makes this an ornamental plant too. Most popular is 'Connover's Colossal', an heirloom variety. ✦ Select plants that are easy to grow. Start with crops that can be planted straight into the ground, such as potatoes, French beans and salad crops. When you have some experience, you can build up the confidence to sow from seeds in pots under glass and plant them out when frosts have passed. If you don't want to sow seeds, you can start with young plug plants that will be a little more expensive, but will save some time. They are readily available in garden centres now and from internet sites direct from specialist growers, where more obscure varieties can be purchased. ✦ Plan the area in the garden you're going to use. Make your kitchen garden into a feature of your overall garden design. Because it's going to have to be positioned in full sun, you'll probably see it from the house, so make sure it looks good. ✦ Build a raised bed if your soil isn't great or has bad drainage. Three creosote and chemical-free sleepers built into a rectangle and filled with rich topsoil will do the job. Improve existing soil with good humus material - well-rotted manure or the contents of your compost patch. ✦ Plan to grow unusual varieties. Carrots of different colours always capture the imagination. Did you know that orange carrots didn't go on sale until the 17th century, when farmers in Holland worked out a way to grow them orange, to celebrate the country's national colour? Purple carrots would go down brilliantly with kids, and bright-red vine tomatoes are fabulous for the summer months. ✦ And use a crop rotation method. Don't grow the same type of vegetable in the same plot year on year, to avoid pests and diseases building up in the soil. Plan to rotate groups of vegetables each year. So legumes (peas and beans), onions and root crops (beetroot, carrot and parsnip) can be grown in one section; brassicas (broccoli, cabbage, cauliflower, Brussels sprouts, swedes and turnips) in another, and then potatoes in the other section. Next year, they all swap places. 'Sturon' has good bolting resistance and stores well. If you have less space, you can plant spring onions - I'd recommend 'White Lisbon' as a problem-free variety.